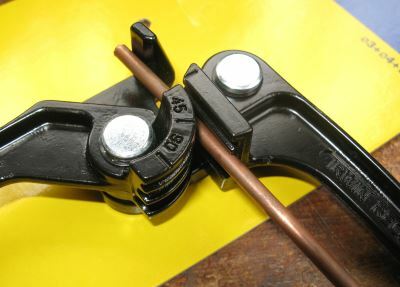 Some years ago I made a pipe bender for small copper tube as I just could not buy one for small diameter pipe. Imagine my excitement when I saw this on the Axminster Tools website. As you can see from the packaging this is designed for 3, 4 and 6mm diameter pipes. The packaging is simple, cable ties to hold the tool to the card and no instructions. 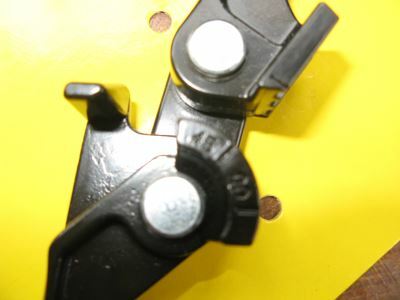 As you can see the jointing of the device is very flexible and opens up on a double hinge. 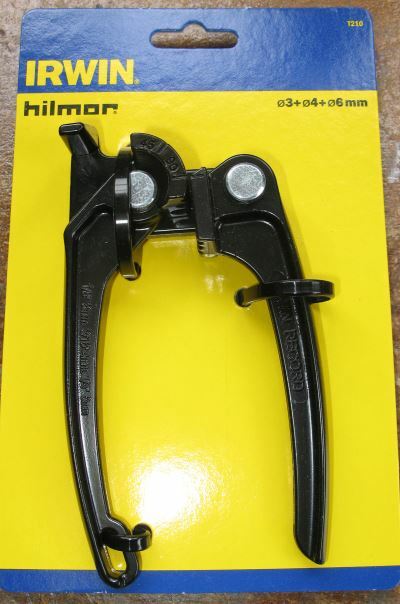 The pipe bender is coated in a thick paint / plastic-coat. This gives an overall quality feel. Top to bottom the grooves for 3, 4 and 6mm diameter pipes. The curved former has angles marked on outer edge for 45 and 90 degrees, a nice simple visual aid although approximate. The grooves are nice and clean and the two parts of the former align cleanly and grip the pipe well. This shows a 4mm diameter pipe aligned in the pipe bender, centre groove. The forms are brought together. 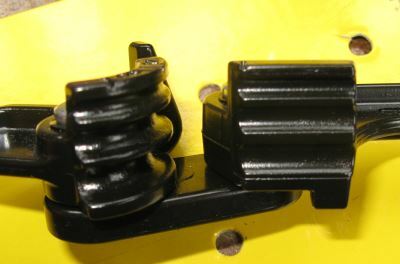 Note that the pipe needs to stick out long enough to lay under the fixed support as shown in the top of this image. This fixed support stops the pipe just rotating around the form and ending up not getting bent. 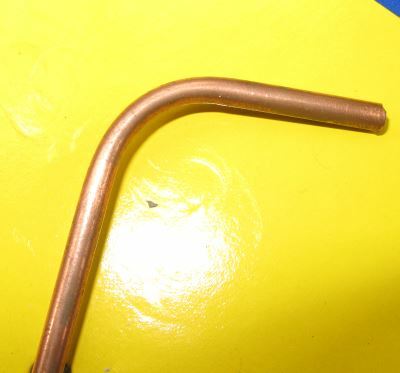 The pipe bent through 90 degrees. The form of the pipe looks good on visual inspection with not too much necking of the pipe. 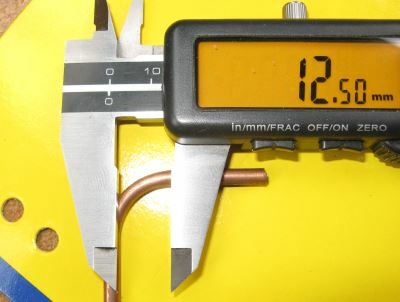 The image to the right shows that the pipe has been flattened by just under 0.4mm – the basic reason for this is that the formers are not quite correct for 4mm pipe or that there is a tendency for the two sides of the former to move apart during the forming process. I suspect that this is actually due to a combination of these: poor fit and forms coming apart. Overall, the pipe bender works very well for the 4mm diameter pipe that I have tried it on, but the radius of the bends it makes is around 12.5mm. This radius is good, but rather large for a lot of model making work. 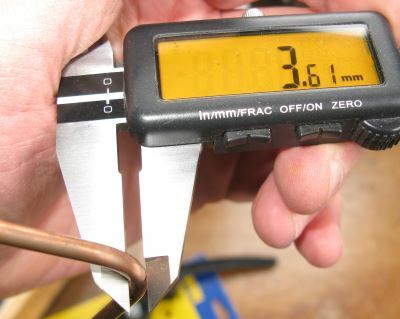 Therefore, you may still need to do as I did and make your own pipe bender, but if you want 12.5mm bend radiuses for 3, 4 or 6mm diameter pipes then this would be ideal.